Growing up as a young girl is hard enough. 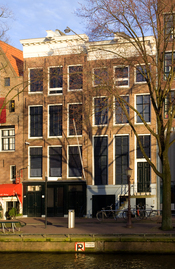 For Anne Frank, the challenge was intensified by her captivity in the Secret Annex. She faces puberty within confined quarters and defines herself as a woman along the way. Anne goes from a young, immature girl to a growing woman despite the extremes conditions of the war outside waged by the Nazis. Before going into hiding, Anne is a normal young girl whose only concerns are of school, friends and boys. Her life suddenly changes when her sister, Margot, receives a call-up notice from the SS. The Frank's go into hiding at the Secret Annex. After arriving at the Annex, Anne misses her cat very much. Anne describes her cat, "Moortje is my weak spot. I miss her every minute of the day, and no one knows how often I think of her; whenever I do, my eyes fill with tears" (29). Anne occupies most of her time by grumbling about the other occupants of the Annex and studying. She fantasizes about what she will buy when the war is over, and also about getting her period for the first time. On discussing her growing excitement about getting her period, Anne goes back later and discusses her own immaturity by saying, "It embarrasses me greatly to read the pages dealing with subjects that I remembered as being nicer than they actually were. My descriptions are so indelicate" (59). As time goes on, Anne feels that her family can not possibly understand her. She starts to separate herself from the group. Anne finds it harder to occupy her time. She waits for the war to end, while biding her time as best as she can. WriteWork contributors. "Anne Frank: Growing Up in the Annex" WriteWork.com. WriteWork.com, 01 February, 2008. Web. 22 Apr. 2019.